When a full moon fills the night sky, Private Investigator Roman Dalton becomes a werewolf and prowls The City’s neon and blood-soaked streets. 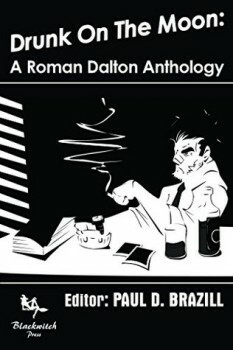 Based on characters created by Paul D. Brazill, Drunk on the Moon is an international collection of noir/horror stories brought to you from some of the world’s edgiest dark fiction writers. DRUNK ON THE MOON is available from Amazon. Paul D. Brazill is the author of Guns Of Brixton, Cold London Blues, The Last Laugh and Kill Me Quick! He was born in England and lives in Poland. He is an International Thriller Writers Inc member whose writing has been translated into Italian, Finnish, German and Slovene. He has had writing published in various magazines and anthologies, including The Mammoth Books of Best British Crime. He has edited a few anthologies, including the best-selling True Brit Grit – with Luca Veste.